It’s only natural to have concerns about flying your pet abroad. Maybe you are moving to Gran Canaria or you are having a month or two in the sun, and so you wish to have your faithful companion with you. So what is the situation when travelling with pets at Gran Canaria airport. What are the airline regulations? For example is your pet allowed in the cabin? Is it safe for your pet to be put in the hold of the aircraft? What type of pets are permitted? The first thing you should do is plan well in advance. There are various regulations that need to be adhered too. You or your representative must accompany your pet when it enters Gran Canaria. The pet travelling with you must have its EU Pet Passport and be micro-chipped along with other health certificates. All documentation must be officially translated in to the Spanish language. Whether travelling in the cabin or hold it will need a proper flight carrier to ensure their safety and comfort. Each airline has it’s own particular rule on whether to allow a pet in to the cabin. Therefore it is best to check with the airline first when travelling to Gran Canaria with your pet. At the present time most UK flights to Gran Canaria do not allow pets to travel in the cabin. If they do, there is a weight restriction of 8kg including the carrier for a pet in the cabin. The size is important as it must fit under the seat in front of you. A non-rigid pet-carrier is only permitted in the cabin. Many airlines will not permit certain pets in the cabin such as; turtles, snakes, guinea pigs, fish, rats, hamsters, mice, pine martens, weasels, ferrets, chickens or rabbits. These animals would need to be in the cargo hold and in secure containers. However, there is a difference between a pet and an assistance dog, hence all airlines will allow a guide dog in to the cabin. Generally if you want to take your pet to Gran Canaria it is likely that it will have to be transported in the cargo hold. Although it may appeared cruel or fearful for your beloved pet to travel this way, millions of pets each year travel in the cargo hold with relatively few incidents. Airlines have a special designated area in the hold for pets. During the flight be assured that your pet will not be sedated and they will not be fed during the flight as it is preferred that they fly on an empty stomach. Microchip. Your pet has to have an ISO 11784/11785 pet microchip that is a 15 digit and non-encrypted. Vaccinations. Your pet must be vaccinated against rabies at least 21 days before it travels to Gran Canaria, but not more than 12 months. If your pet has a current vaccination but and has no microchip, it must be vaccinated again after the chip is implanted. This will allow your pet’s microchip number to be included in the vaccination documentation. NOTE: UK regulations mean that pets can fly out of any airport but can return only to specific airports in the UK. Check with your selected airline before booking your route. First thing is to let your airline that you will be travelling with an assistance dog. Check with your airline’s customer care department for more information and on their specific requirements. The airline will need at least 48 hours notice of your travel date. Each airline has specific requirements to allow a Guide/Assistance Dog in the cabin. Listed below are some of the guidelines from various airlines flying to Gran Canaria. An identifying jacket or safety harness should be worn by the dog. The guide dog must be an official certified and trained assistance dog. Have your papers ready in case you need to prove this. Passsengers travelling with a guide dog need to bring an absorbent mat for the dog. The dog must sit on the floor at the owner’s feet. All animals travelling in the EU must be registered and will need to have the correct documentation. The International Guide Dogs Federation (IGDF) and the Assistance Dogs International (ADI) websites provide information of the qualifying training organisations. The good thing though your Assistance or Guide dog will normally be able to travel free of charge. If you are flying with an assistance dog you should request PRM assistance at the airport beforehand. Be sure to read our page on how to request PRM assistance at Gran Canaria Airport. 8 Essential Tips When Flying to Gran Canaria Airport with a Guide Dog or Assistance Dog. Always speak with your local vet for their advice when flying regarding the dogs health. 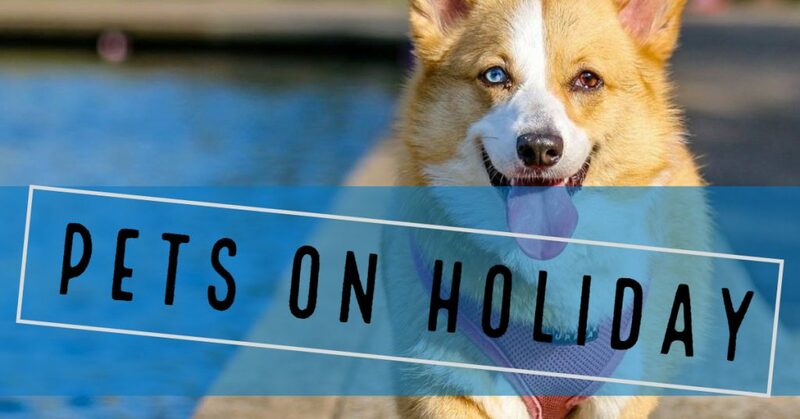 Check for the latest criteria on the UK Government Defra website on pet travel abroad. Speak to the guide dog instructor to get advice. For obvious reasons, a few hours before you arrive at the airport limit your dogs water intake. Avoid allowing the dog to travel on a full stomach. Provide some exercise for your dog before travelling. Arriving at the airport in good time with your dog’s documentation is good practice. Have an an absorbent mat on hand. Take your dogs favourite toy or small treat in the cabin. These can often keep the dog calm during take-off or landing.